Researchers at MIT have developed an approach to make tumor cells more susceptible to particular types of cancer treatment by coating nanoparticles on the cells prior to delivering drugs. By tethering numerous miniature particles to the surfaces of cancer cells in the presence of a mechanical force, the MIT team made the cells a lot more vulnerable to attack by a drug that triggers cancer cells to commit suicide. 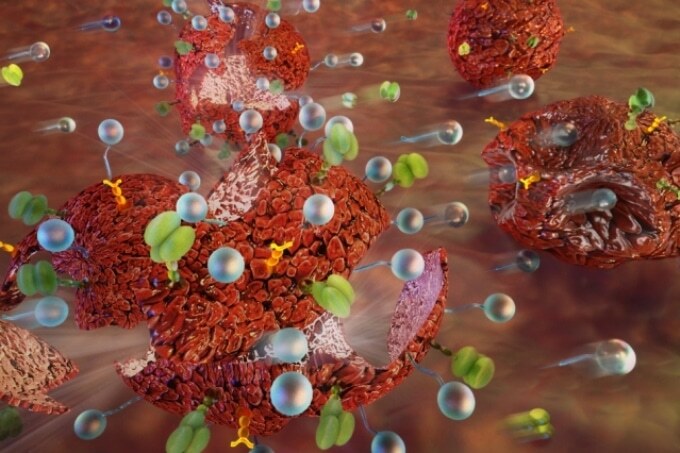 It is evident that the tethered nanoparticles boost the forces exerted on the cells by flowing blood, which increases the chances of the cells to die. When you attach many particles to the membranes of these cells, and then expose them to forces that mimic those in the human body, like blood flow, these therapeutics become more effective. It’s a way of amplifying the forces on the cells using polymeric materials. In mice trials, the team discovered that the tethered nanoparticles made the cell-suicide-inducing drug 50 %operative, and this arrangement eliminated nearly 90 % of cancer cells in the mice. Robert Langer, the David H. Koch Institute Professor at MIT, is the paper’s senior author. The research paper has been published in the March 20 issue of Nature Communications. In addition to exploring tumors’ abnormal biochemical and genetic traits, researchers and engineers in the past few years have studied how tumors’ physical characteristics add to disease progression. Solid tumors use physical forces, such as their altered blood flow and amplified stiffness, to enrich their growth and survival. Forces applied by flowing blood and fluid in soft tissues also influence the behavior of cancer and various host cells. In the latest study, the researchers aim to define whether physical forces such as those applied by blood flow might impact how tumors react to drug treatment. They explored an experimental drug called TRAIL, which is a protein expressed on a variety of cells of the immune system. TRAIL forms a part of a group of tumor necrosis factors that bind to death receptors on cell membranes, sending them a signal that triggers apoptosis, or programmed cell death. Preliminary experiments showed that tumor cells became more vulnerable to this drug when exposed to shear forces from physiological fluids. “Under these flow conditions, more tumor cells began to die in the presence of the therapeutic,” Mitchell says. That made the researchers to theorize that they could further raise the susceptibility of the cells to the treatment by increasing the forces acting on them. One method to achieve that was to attach miniature particles to the cell surfaces. Behaving in the same manner as balls on a string, the tethered particles batter and yank at the tumor cell surface as blood flows by, rendering the cells more susceptible to the cell death signal from the drug. The particles, which can be injected into the bloodstream, are formed using biodegradable polymers called PLGA. These particles are coated with another polymer called PEG that is tagged with an antibody or ligand specific to proteins located on tumor cell surfaces, which enables them to be tethered onto the surface. In mice trials, the MIT team discovered that attaching particles to tumor cells and then using TRAIL to treat them destroyed metastatic tumor cells in the bloodstream and also decreased the development of solid tumors in mice. The researchers tested particles ranging between 100 nm and 1μm and realized that the largest ones were more effective. Furthermore, as greater numbers of particles were tethered to the surface, more number of cells was destroyed. The effect of the treatment seems to be specific to cancer cells and does not lead to apoptosis in healthy cells, the researchers explain. Michael King, a professor of biomedical engineering at Cornell University who was not involved in this research, described the technique as highly creative. “I’ve never seen another study where anyone tried to use particles attached to the cell surfaces to mechanically amplify the cells’ drug sensitivity,” says King, adding that this technique may also be relevant to other drugs. The researchers feel that the particles may improve TRAIL’s impact by compressing the shroud of molecules that typically surrounds cancer cells, making it easier for the drug to interrelate with receptors on the cell surface that switch on the cell death pathway. When you expose cells to forces and then these particles are coming down on the cell, they could be flattening all these molecules on the surface. Then the receptor can come in better contact with TRAIL to induce tumor cell death. The MIT team is currently looking at ways to use this approach in along with other drugs that trigger an immune response, such as drugs that generate a “cytokine storm” — a large discharge of signaling chemicals that attracts a number of immune cells to the site to kill the tumor. A Burroughs Wellcome Fund Career Award at the Scientific Interface, a Ruth L. Kirschstein National Research Service Award, and the National Institutes of Health funded the research. The paper’s other authors include Koch Institute postdocs Pedro Guimarães and Omar Khan, and Koch Institute technical assistants Jamie Webster and Amanda Chung.